Saul and Clara work with a Peruvian mission group called Segadores, which is dedicated to reaching the unreached tribes of Amazonian Peru. They form part of the core mission group and Saul has been a past president. Currently they are committee members. Their ministry takes place in two geographical areas, one is the Amazononian jungle where they endeavour to reach various tribes with the Gospel. The other area is Lima, the Peruvian capital, where they are involved in Segadores' training school. At the training school they coordinate the Cross-Cultural Missionary Training (ETAE) where native tribal missionaries are trained in how to effectively reach their own people. Saul’s role is to organise, promote, and direct the training programme for missionary candidates between the months of January and March. Clara is in charge of preparing the food for the students. As a Bible teacher, Saul also gives Bible training with the Precepts Inductive Bible Method to pastors and Christian leaders six times a year in different parts of the country, from April to November. He does this mostly in tribal communities of the jungle and Andes. He also teaches cross-cultural subjects in city churches and at pastors’ conferences. Together he and Clara also give marriage counselling to families and disciple them. Currently they work 50% with Segadores and 50% with a church in Pariachi, Lima. The church is involved with migrants from the Andes and the Amazon who come to Lima to work, find there is none and set up life in shanty towns in Pariachi. Development of this partnership began in 1999. They were initially considered for partnership by Bright Hope World's Executive Chairman. This partnership directly benefits Saul and Clara and their family, providing financial support so they can continue their ministry with Segadores. However this thereby indirectly benefits various tribes of the Amazon. These tribes speak their own languages and a number of them have never had, until very recently, any contact with people outside their tribes. The ministry of Segadores has a spiritual content as well as a physical health and wellbeing content. This ministry provides a holistic approach in that they not only endeavour to communicate the good news of Jesus Christ but they also provide for the physical needs of the people they are reaching. Saul is from a Quechua village in the Andes of the State of Lima. His parents were Christians and when he was 14 years old, God worked in his heart convincing him he was a sinner and needed salvation. In 1976, at the age of 18, God called Saul to serve full-time. Leaving his village, he went to the city of Huancayo to study the Bible for four years. In 1979 he met Peter Hocking, Director of Segadores, and then left to work with Segadores among tribal communities in the jungles of Peru. Saul began by working with the Yanesha tribe, and with Quechuas of the Huanuco region. He worked for 8 years training Christian workers and Sunday School teachers. From 1988-1991 he studied in the Evangelical Seminary of Lima. Clara grew up in the Andes of Peru, in the State of Ancash but subsequently went to live in Lima. While working in the home of the Hockings, she heard the gospel and received Christ as her Saviour. 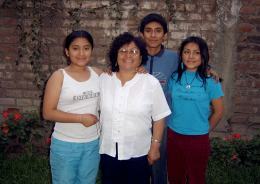 Later, she felt God’s call to prepare herself in the Evangelical Seminary of Lima in order to serve God. 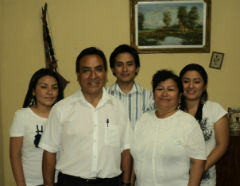 Saul and Clara were married in 1989 and have three children; Yeremias (born 1989), Yudith (born 1991) and Yuliana (born 1994). Saul and Clara’s are accompanied by a number of fellow workers including Manuel and Luci, Melchor and Augustina, Peter and Martha, Macedonio and Nita, Antonia, Oscar and Aura, Marcos and Adina. Saul and Clara’s three children also all have a vision to reach the unreached tribes of the Amazon. Saul and Clara's vision is to reach the unreached tribes of Amazonian Peru. Their strategy is to make initial contact and progress with community projects to the point where they are able to share the Gospel with them. The annual strategy is to progress from where they have reached, which varies from tribe to tribe, to the next point, moving closer to the goal of introducing them to the saving grace of Christ. This is a long term work as, in some cases, tribes speak a language that no one has ever heard or learned previously. There have been a number of tribes discovered over the past 10 years or so that civilisation did not know existed.